Want to have a dessert but afraid of the calories, try a healthier option, the Melon or Cantaloupe salad. Refreshing and flavorsome, yet with high nutritional value the fruit is cultivated all over the world and can be found in various sizes and colors. It is believed that the fruit originated from India or Persia and was cultivated in Egypt around 2500 years ago. The European version of the fruit was cultivated by monks of the 15 century in the Italian region of Cantaluppo which gave its modern name. I generally buy my fruits and vegetables from the farmer’s market of my neighborhood and it is the same with this melon. This French melon is from Quercy (from the farms of La Pinède), a region in south-west France, where the earliest French melons have been cultivated since the 16th century. 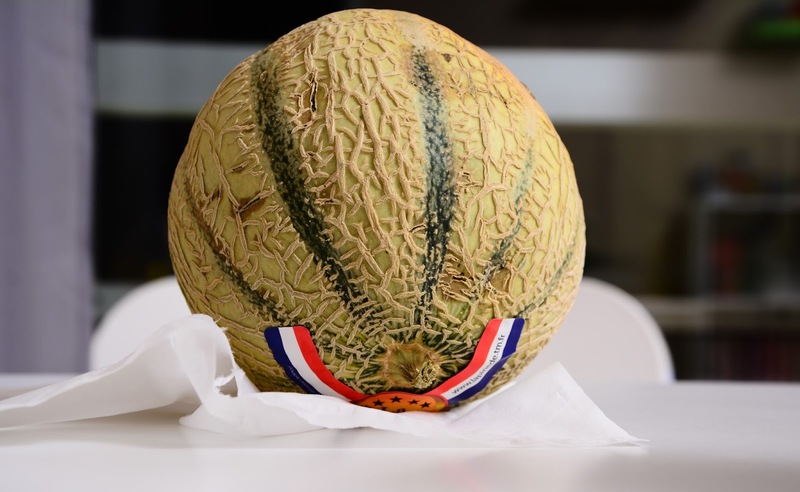 Legend has it that Alexandre Dumas was so fond of melons, that once he exchanged all his published works with a library for a lifetime supply of 12 melons per year. But what are the benefits of Melons? 1) Melons are low in saturated fat and sodium and very low in cholesterol. 2) Melons are rich in potassium (around 300mg per 100g), vitamin A, Vitamin C.
3) As they are high in potassium and low in sodium, they prevent water retention in the body. 4) They are also rich in Beta-carotene also known as provitamin A (100g of melon contains half the required level of Beta-carotene), which is the cause of its orange flesh. Beta carotene is a good anti-oxidant. 5) They are a good source of dietary fibers which are good for the prevention of Kidney stone disease and helps in intestinal transit. 6) They are also a source of Vitamin B6, niacin and folate. 7) Being 90% water, melons are very refreshing and good to eat after meals with a calorie intake of only around 48kcal per 100g. To choose a good melon, one must check that they are heavy and hard on the outside. They have a sweet flavor but too much means that the melon is ripe and thus not good for the nutritional values. Here is how I like to take my melon. 1) I cut it into half and then scoop out the seeds and the filaments with a spoon. 2) Then I cut the halves into strips and remove the skin. 3) I prefer cutting up the flesh into small cubes and spread some roughly chopped fresh mint leaves on it. 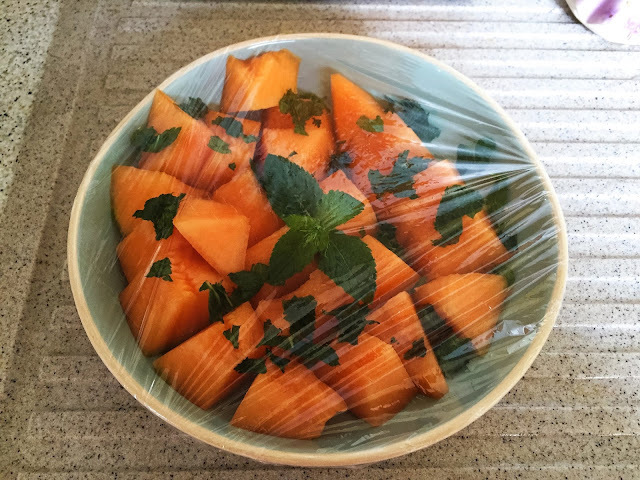 4) To help the flavor of the mint infuse with the melon, I cover it with a cling film and refrigerate for at least 5-6 hours. 5) I take it out 10-15 minutes before serving, rather before enjoying the fresh flavors of mint and melon. 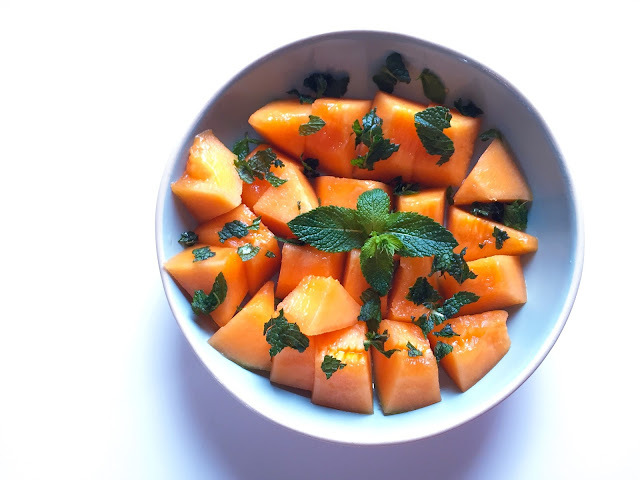 Want to have a dessert but afraid of the calories, try a healthier option, the Melon or Cantaloupe salad. Refreshing and flavorsome, yet with high nutritional value the fruit is cultivated all over the world and can be found in various sizes and colors. Cut it into half and then scoop out the seeds and the filaments with a spoon. Remove the skin and cut the flesh into small cubes and spread some roughly chopped fresh mint leaves on it. Cover it with a cling film and refrigerate for at least 5-6 hours.